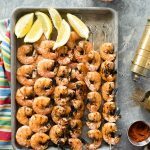 This easy recipe for Grilled Spicy Salt and Pepper Shrimp Skewers may be increased to feed a larger crowd by increasing the ingredients proportionally (e.g. doubling, tripling). Servings sizes will depend on diners appetites. With side dishes a skewer of 5 shrimp per diner is perfect.